When is it Smart to Buy Used Office Furniture? Buying used office furniture can save you money and time, and nobody will know the difference. The short answer is, “pretty much always.” When you buy used furniture, you’re going to save a lot of money and receive essentially the same products. At reputable used furniture dealers like Mark Downs, you can be confident that your pre-owned furniture is like new, as we ensure everything meets the same high standard that our customers have come to expect. The most obvious benefit, as mentioned above, is that used office furniture will save you lots of money. You can purchase nearly new office furniture products for as low as 15 to 25 cents on the dollar. These pieces, for the most part, have been in service for only a few years at most and, while there may be a scuff or two, we ensure nothing will be too noticeable. We wouldn’t dream of selling furniture with built-in problems. Quality: Used office furniture has withstood the initial test of time and is still mechanically and materially sound. When you purchase new, the warranty offered may be a good indication of the inherent quality. When you purchase used, brand-name, quality office furniture, you have proof. Minimal Depreciation: When you buy new office furniture, you can expect its resale value to depreciate to 25 percent or less of its original cost. When you purchase quality used office furniture, its value actually increases based on the cost of comparative new furniture and its resale value may remain as high as 75 percent of what you paid. Purchasing good quality used furniture is a much better investment than purchasing “cheap” new furniture. Environmental Benefits: Compared to recycling aluminum cans, plastic bags and newspapers, making use of previously-owned office furniture is a much better deal for our planet. When you dispose of wood furniture, it winds up in landfills. Steel furniture must be disassembled before recycling and the costs of recovery are prohibitive. You will be preserving our forests and natural resources, protecting our atmosphere, saving energy, and saving valuable land-fill (and warehouse) space. Fast Delivery: Except for the low-priced “commodity” commercial furniture available from mass-merchants and discounters, office furniture is made to order. Fine office furniture generally takes 6 to 12 weeks to produce. Used furniture is on hand and ready for immediate delivery. In most cases, it can be shipped a day or two after you place your order. If you want it refurbished, add a week or two at most. When you’re ready to look at used furniture, you should start with Mark Downs. 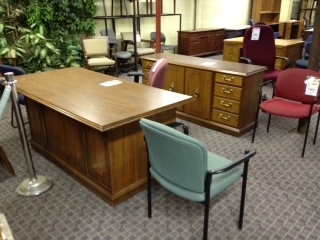 Search our website for used office furniture pieces or stop into our showroom, located conveniently in Cockeysville. Have a specific question? Call us today at 410-771-6800 to speak to a trained staff member. You can also follow Mark Downs Office Furniture today on Pinterest, Facebook, LinkedIn, and Twitter! This entry was posted on Wednesday, April 20th, 2016 at 4:26 pm. Both comments and pings are currently closed.